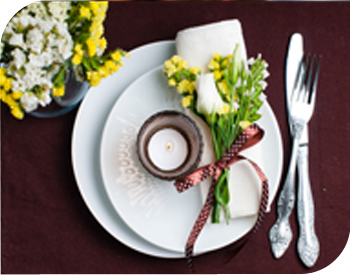 Choosing a menu for your spring wedding offers many, many options. With warmer weather and the first local crops coming to market, featuring lighter foods is a wonderful way to celebrate your special day. Looking for some great spring wedding menu ideas? Check out these options courtesy of Akron wedding reception caterers. Keep it fresh. Incorporating fresh young vegetables, such as baby carrots, asparagus, new potatoes, and sugar snap peas are bright flavors in contrast with the traditional winter menus that are heavy on meats and potatoes. Include a new twist on dessert. Instead of a heavy cake, such as dark chocolate and raspberry, try offering a more seasonal option such as carrot cake, chocolate cake, or coconut cake. The traditional Italian wedding cake, a cassata cake, made with vanilla sponge cake, pastry cream, fresh strawberries and whipped cream can be a light way to end your wedding celebration. Sugar cookies, petit fours, mini lemon-scented cupcakes and chocolate covered strawberries are other light additions to your dessert buffet. Use springtime flavors. Instead of using pungent fall and winter spices such as garlic, try incorporating some lighter flavors. Offering lemon and rosemary scented chicken breasts served with wild rice or salmon roasted with thyme and sea salt are seasonal options that will please your guests. Update your drinks. According to caterers in Cleveland, a trend among couples is to have their own signature drink at their wedding. Use a citrusy-based drink, such as pink lemonade or a Margarita as a base for your own celebration-inspired beverage. Keep salads light. Spring is a great time to change from Caesar salads to a lighter mix that features baby greens or mesclun. The addition of hard boiled eggs, goat cheese or spring peas or even toasted pecans and strawberries can provide a flavorful alternative. Adapt your appetizers. Offering mini egg soufflés or shellfish-based appetizers are a wonderful way to lighten your menu. A selection of cheeses and fruit are also a lovely springtime addition. There are many ways to adapt your wedding celebration to the warmer weather of spring. Catering services in Cleveland and Akron that specialize in wedding receptions suggest incorporating fresh young vegetables, lighter desserts such as a cassata cake, and egg and fish based appetizers are excellent options for couples who want their special day to reflect the spring season.